Fennel is a sweet vegetable with a subtle aniseed flavour. 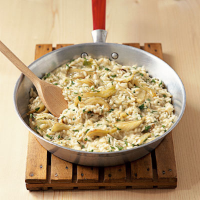 Team it with dry white wine to add depth and flavour to this simple vegetarian risotto. Bring the stock to a simmer in a small saucepan. In a frying pan, heat 1 tablespoon of the oil over a medium-high heat. Add the fennel and garlic and season to taste. Cook for 15 minutes or until soft, stirring occasionally. Leave to one side. Meanwhile, in a medium-sized heavy-based saucepan, heat the remaining oil and the butter over a medium heat. Add the shallots and cook, stirring frequently, for 2-3 minutes or until soft but not coloured. Add the rice and stir to coat in the oil and butter for 2 minutes. Season with a little pepper. Stir in half the wine and increase the heat to bring to a gentle boil. When the liquid has been absorbed by the rice, start to add the hot stock, a ladleful at a time. Stir until the liquid is absorbed before adding the next ladle. After about 20 minutes the rice should be creamy but still with a slight 'bite'. Add the last ladleful of stock, along with the fennel, half the parsley, half the cheese and the remaining wine. Stir and season to taste then divide the risotto between 2 deep plates and serve immediately, with the remaining cheese and parsley scattered over the top. Serve with Waitrose Watercress, Roquette and Spinach Salad. To serve 4, simply double the ingredients. The fennel mixture can be cooked the day before, covered and kept in the fridge until ready to use. Not surprisingly, the crisp white wine used in this recipe is a great match for this vegetarian dish.